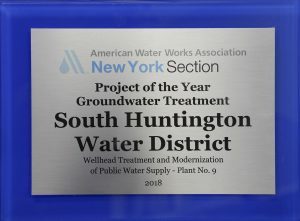 The South Huntington Water District is one of the largest water districts in New York State and serves over 80,000 residents 24/7, 365 days a year. Geographically speaking, the District’s service area is approximately 21.77 square miles encompassing a large part of Huntington Station, all of Melville including Suffolk County’s largest business and industrial sector, South Huntington, and sections of Huntington and Cold Spring Harbor. 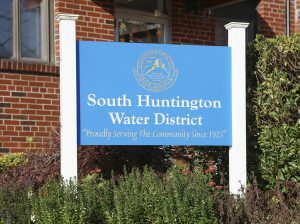 The South Huntington Water District is a municipal corporation, established by the Town Board of the Town of Huntington on June 16, 1925 and is duly functioning under the laws of the State of New York, the County of Suffolk and the Town of Huntington. Today, our pumping and distribution infrastructure is substantial including 23 deep wells, 271 miles of water main, and over 1,700 fire hydrants. The District has seven storage tanks with a total capacity of approximately 10,000,000 gallons and a pumping capacity of 30,000,000 gallons per day. The District takes great pride in maintaining our well and treatment sites, making every effort to blend our facilities into the communities. Maintaining such a large infrastructure makes SHWD quite a busy district. Long ago, we instituted a program of regular preventive maintenance, and we have judiciously incorporated SCADA and other modern management systems, all to ensure plentiful supply, uninterrupted delivery and cost efficiencies. We adhere to standards at all times. It’s important to know that all our water is treated to the strict standards of the New York State Department of Health and the United States Environmental Protection Agency. Before it leaves our well sites, your water is compliant with all applicable regulations. While the water is in transit, we add a small amount of chlorine to destroy germs and protect water quality against waterborne pathogens. We also raise the pH to neutralize the generally acidic nature of our groundwater. Water not immediately used by consumers is stored in our seven steel and concrete reservoirs or tanks. Fortunately, our District includes some of the highest terrain in the area, and so traditional elevated tanks on steel legs are not necessary. An often-overlooked part of our distribution system is the network of fire hydrants that protect people, firefighters and EMTs and facilities as well. South Huntington Water owns and operates more than 1,700 fire hydrants, providing emergency fire-fighting water to six Huntington Fire Departments: Huntington Manor, Melville, Greenlawn, Dix Hills, Cold Spring Harbor and Huntington.